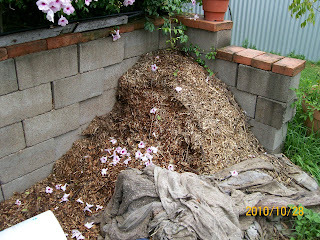 The Brown snake reclining on one of the compost piles was a reminder to write about composts. This particular Brown snake was a lovely pale brown. 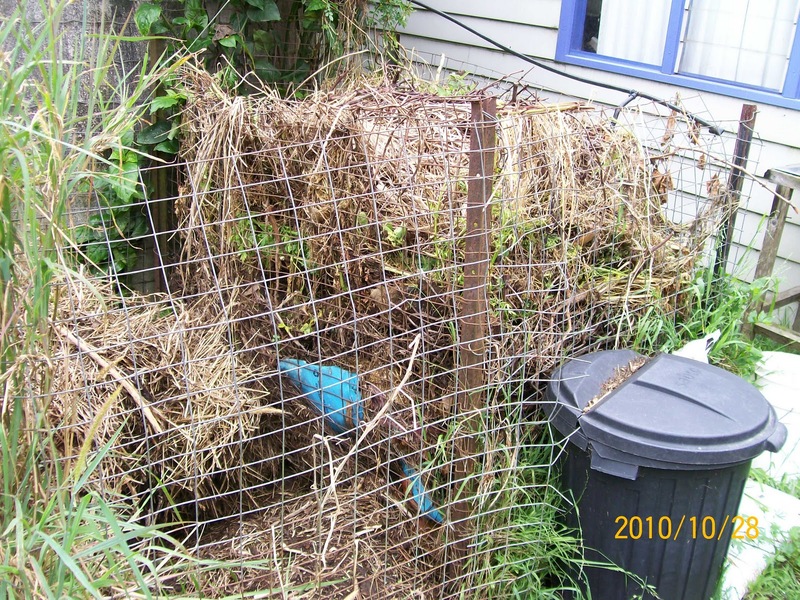 It looked in awfully good health, most probably from the mice it was devouring out of the compost piles. It didn’t seem in any great hurry to move from its warmth in the sun but 5 minutes later it had vanished. Probably just making sure nobody saw in which compost pile it was housing itself. While on the subject of Brown snakes, there was the one that we found in the workshop caught in some stored bird netting. That is the problem with both bird netting on the ground and having a small head and big body. Rather than thoughtlessly disposing of this Brown we were able to track down an experienced snake handler living locally who was happy to come over and remove the snake. It was after he arrived that we were informed he would hold the snake and we would have to cut the netting away from the head. This requires great trust. Once the successful removal of the netting was concluded, we decided that as this was its home, the best place for release was in the nearby paddock. After the release the handler commented with some enthusiasm that she (the snake) was a mature female and had recently had some offspring. Sharing the world with other species can be difficult at times. One settling point is that mature snakes seem to know the routines of their territory hence they manage to stay out of the way. Juveniles are a bit of a problem as they are not familiar with the routines and are frightened and are more likely to act aggressively as a way of self defence. At least their teeth are small. The kitchen waste i.e. vegetable trimmings, tea leaves, ground coffee and scraps of paper etc are put into a small rectangular structure assembled from loose bricks. When it is full a little animal manure is placed on top and then it’s covered with straw or hay and left for a couple of months. There are two of these going at once. One has been bedded down and is maturing while the other is being filled. As the maturing pile sinks, the bricks are transferred from it to the growing pile, that way economising on the number of bricks. The fully decomposed material is used in the vegetable garden. 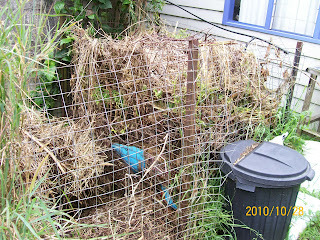 The garden waste from weeding is put into one of two large bins with mesh sides held up with star pickets. When one is filled it is left and the other started. After a few months the uncomposted material on top of the first pile is removed and added to the second pile. 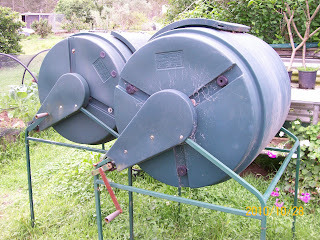 The material from these composts is use to fill the tyres that grow potatoes. 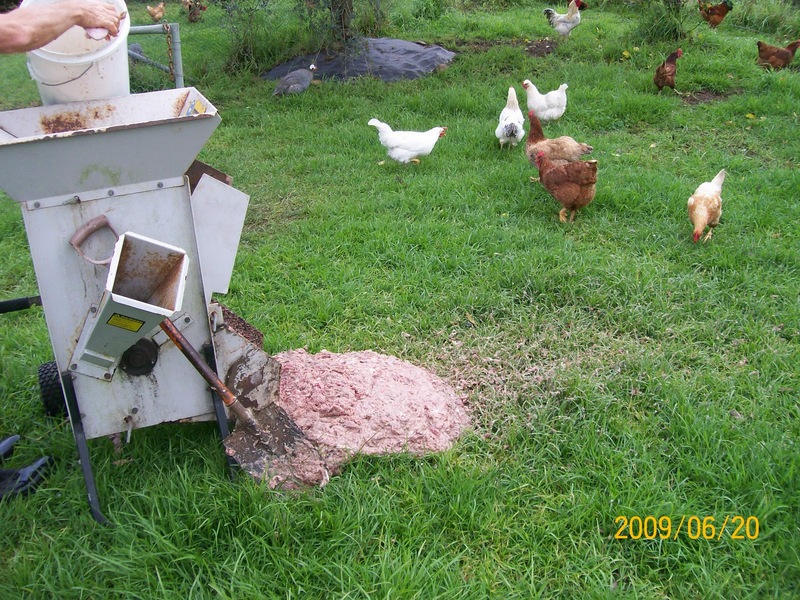 The compost tumblers are filled with grass clippings, some chicken litter and chipped prunings from the mulcher. There never seems to be enough of this available in a mature state at our place. If it’s not fully composted and is required for a new vegetable planting a trench is dug in the bed and the material buried as is. By the time the seeds or seedling get their roots down to the contents of the trench the worms will have done their job. There is the worm farm in black plastic rectangular bins. 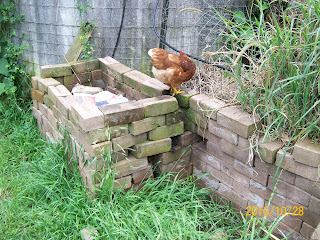 Firstly, to keep a home base for the red compost worms. Secondly, to provide worm wee and thirdly to compost anything we don’t want the dogs to dig up such as cooked chicken bones or small dead creatures. 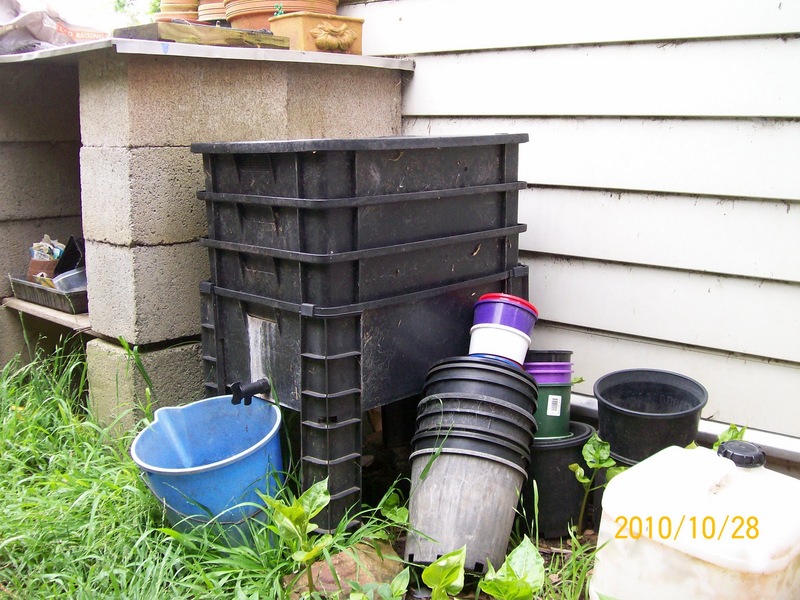 Lastly there is a staging area to hold either surplus compost if the tumblers or material from the mulcher get ahead . Another useful feature of garden mulchers is that they can turn fish frames (ie heads, skeleton and tail) into Omega 3 rich mince. Because it is a bit of a messy task its best to process a large quantity at once. 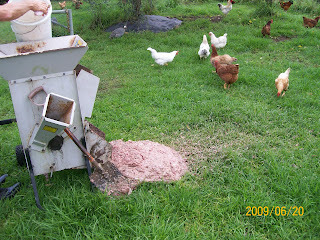 These can be bagged into suitable sized batches and frozen then put out for the chooks on a regular basis. Just plonk it on the grass in one pile as they will graze on it until it disappears. The mulching of fish frames is done near the chook yard so the house keeping afterwards is mainly performed by the girls themselves. Standing in front of the mulcher and trying to catch the flying fish mince seems to be a popular activity for our girls. Hosing it out at the end just gives the girls more. Don’t use shark frames as they create havoc with the mulcher. Shark is also at the wrong end of the food chain if you want to keep your mercury intake at low levels. We haven’t been struck by the neatness stick. There are far too many other important jobs to be performed as part of our self sufficiency. You won’t find us shaving the lawn or nipping every out of place blade of grass. The lawns get done in time and the edges trimmed and it always looks nice afterwards but it is not a regular event. The vegetables get weeded but not every day. A few weeds are always showing. The vegetables aren’t always in neat rows. Firstly, there is always the odd failure and secondly we make every attempt at succession planting to avoid that wasteful glut. Our concentration is on diversity as much as anything. Many plants are left to go to seed. This is inherently untidy but returns substantial benefits. Parsnip, parsley, coriander, fennel, endive, several types of radicchio, celeriac and land cress are now self sown. The cats and dogs are allowed to wander in and out of the house and they always forget to wipe their feet. Hence we have tiled floors in most rooms while other rooms are kept out of bounds. Vacuuming is not a high priority. Usually we are prodded into action when visitors are imminent. This usually ends up being a major event for us which includes washing the floors. We are particular in the kitchen as we spend a lot of time preparing and cooking. There is never enough bench space at our place and so dirty dishes are not left lying about. Pots and pans are in continual use and consequently are quickly cleaned once used. The dishwasher is run every day. Somehow we manage to fill it easily. Wine bottles which will be reused get the dishwasher treatment as well. Some things are hand washed buts that’s usually because they can’t fit or shouldn’t go in the dishwasher. Time is at a premium when sustaining our style of living and the dishwasher is very efficient. As we are on tank water (albeit over 100,000 litres) it’s still important to conserve water. Only three criteria were used for dishwasher selection: lowest water usage, lowest power consumption and lowest noise level. Having said all that about lack of neatness, there are some essential rules. One of which is anything that has been finished with is returned to its usual storage place. No wasted time wandering about looking for it or trying to remember where it was last used. This applies to the garden implements, workshop tools, kitchen utensils and anything else. Putting away immediately when finished may seem a chore when in a hurry but once the routine is developed it becomes automatic and the dividends commence flowing. The photograph of the workshop was taken when it was first completed it has a much more used look now but the tools are still returned to their rightful place. Repairing anything on the go is a speedy process. There seems to be an excessive emphasis in the world on the use of cleaners, antiseptics and antibacterial agents. Surely attempting to live in a sterile environment can’t be good for our body’s ability to develop its immune system. There is a place for hygiene in the preparation of food but not to the extent of spraying every surface with antibacterial agents. A little soap and hot water is enough. When making beer or wine hygiene is critical with fermentation containers and bottles. Leafy vegetables need to be washed to remove grit and root vegetables need a good scrub but peeling only removes the goodness that lies beneath the skin. Cuts and scratches are inevitable when working outdoors. The wearing of gloves assists in avoiding many of these but sometimes it is difficult to perform certain tasks with hands encased. It doesn’t hurt to shed a little blood from a cut or scratch, this is the body’s way of rinsing out any contaminants. A good wash in clean water is usually all that is needed. Some temporary protection from further contamination or excessive bleeding may necessitate a bandage or adhesive patch if returning to a dirty task. But once clear of dirty tasks take off the bandage and let fresh air circulate and dry out the wound and let natural healing occur.